Restoring health through correcting vertebral subluxations or spinal misalignments is what chiropractic care is all about. Dr. Gregg has a few charts to show patients the difference between a healthy spine and one that’s subluxated. He’ll also show you your X-ray and a normal one so you can see the difference. Often, patients will recognize after looking at the images that something is not right. He will then explain how the spine can degenerate over time when there is subluxation. It also can give you more energy and allow you to sleep better and function optimally. Getting you out of a state of disease to where you’re coming in for maintenance care is Dr. Gregg’s approach to care. A typical maintenance care protocol is twice a month or once every six weeks, whatever works best for you. 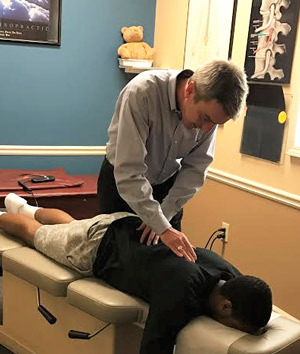 As a full spine practitioner, Dr. Gregg does a lot of extremities work, specifically on the shoulders, elbows and knees. He also practices Activator Methods®, Diversified and Thompson Drop, providing patients with a range of techniques that can be custom-tailored to provide optimal results. If you’ve never experienced the remarkable benefits of chiropractic care, we invite you to contact us today to schedule an appointment!